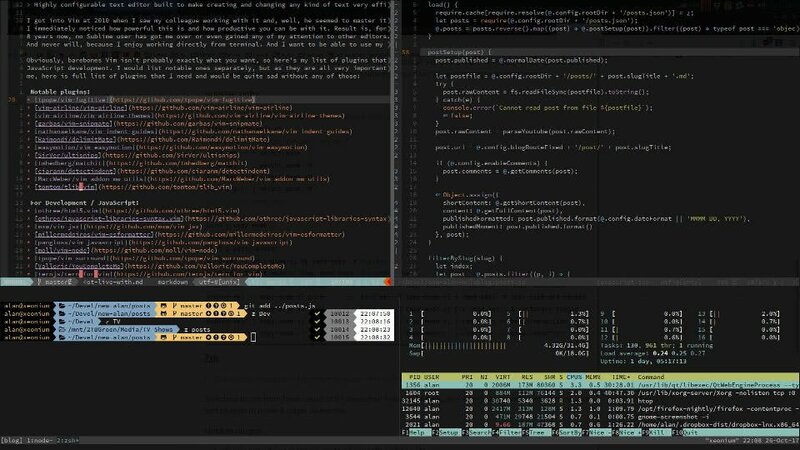 I got into Vim at 2010 when I saw my colleague working with it and, well, he seemed to master it and I immediately noticed how powerful this is and how productive you can be with it. Result is, for almost 8 years now, no Sublime user has got me over or even gained any of my attention to other editors. And never will, because I enjoy working directly from terminal. And I want to be able to use my favourite editor from any server I ssh into. unbind-key -T copy-mode-vi Enter     ;   bind-key -T copy-mode-vi y send-keys -X copy-pipe-and-cancel "tmux show-buffer | xsel --clipboard --input"
Switched to zsh from bash cause of it's awesome features and plugins. Again, you need some frameworks and plugins to make it super awesome. z - Access your most accessed / recent folders with ease. Awesome little thingy! Cause postman is so slow.